Can't wait for Kirby:Triple Deluxe to come out? Then pull up a comfy chair as Nintendo Life plays the Japanese version and takes you through the first world of Kirby's latest adventure; we've got a new foe, old friends, lots of hats and pixel-style collectable key-chains! Damnit they should've taken the opportunity to move the series into 3D platformer territory. Ah well. Hopefully the Wii U. Good God, Rainbow Kirby is overpowered O.o. Can't wait for the uk release of this, looks like sooooo much fun. Is it 60fps that is the big question for me. (The way Youtube works you cannot always tell - Looks like it isn't to me though from this). Kirby is too adorable for words. Haha, Rainbow Kirby is so broke. Although it's not like Kirby games have ever been particularly challenging. It appears that the game will probably look amazing in 3D. Look at all of those layers in the levels! This looks like so much fun. I can't wait for an American release date. One of my most wanted games for 2014. The Smash Bros-esque multiplayer and Dedede's rhythm game extra modes look very interesting. i never liked the kirby series, this doesn't look any different. i'll pass. I just beat this yesterday. Didn't 100% the save file yet but I'm at 85%. There are a ton of key rings to collect. US in May calling it now. can't wait! Love me some Kirby! Seems to have that old Kirby charm! Music and visuals seem really nice too! Wow, that might be easy enough for me. Mario and most other platformers are too difficult for me to enjoy (for some reason, if it's possible to fall down, I do), but this looks pretty idiot proof. Kirby is adorable. So when is the western release? 3DS looks more and more desirable, and seems to have games that would make it desirable for a while. Now make some damn Wii U games Nintendo!!! Shift your focus a bit, please! @Tritonus wii u rating: 9 3ds rating: infinity!!!!!!!!!!!!!!!!!!!!!!!!!! 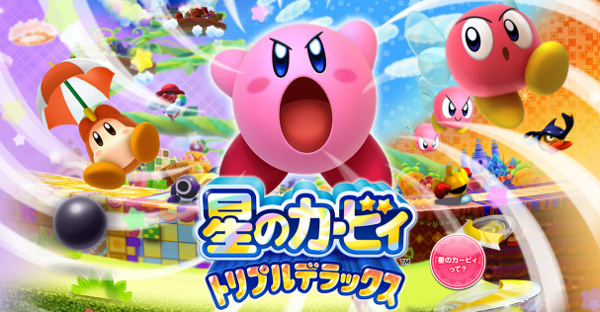 Looks like a fun sequel to Kirby's return to dreamland! And nice intro by the way! Hoping that the European release dates for this and Yoshi's New Island are revealed soon.